I’d already done a couple of short test rides locally. The first, on the way home from the bike shop, which included some offroad sections by the river through Radloff park plus a short but steep-ish section of downhill single track off Hillcrest Road. The second ride was all on tar, my regular Rollercoaster hill loop. But I’d yet to follow-up on William’s instruction to put some proper dirt under the wheels of my nearly-new Niner. With all the prep done for the day after, and Yoli and Ben watching a movie, a sunny but cool Christmas Eve afternoon seemed the perfect time to put that right. I already knew from the previous rides that the setup needed work. The saddle was probably about right, both in terms of leg extension and fore-aft position over the bottom bracket. But there was a definite feeling of being a little too stretched out. My guess was that the solution would be a shorter stem (maybe by 10 to 20cm) and flipped to raise the bar up. I put any concerns of comfort out of my mind though as I hit the trails – that was a problem to be solved in the New Year with a proper bike fitting. Today was all about learning what a drop handlebar multi-purpose bike could do offroad. The early part of the Wannabee club trails are mostly wide farm tracks through the vineyards. My initial impression was something of a surprise – the ride was far less harsh than I’d expected for a bike with no suspension. Loose gravel and sand though where a different matter altogether, especially when cornering – skittish, and more than a little nervy. The problem wasn’t the bike of course it was me. 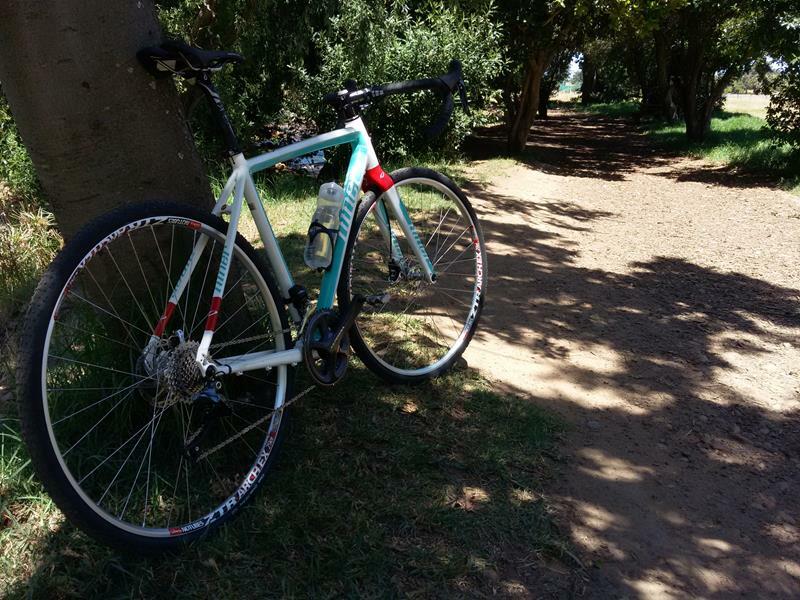 I was slinging it around like a mountain bike, not accounting for the narrower tyres and very different geometry. Places where the Anthem would have just blasted through, the Niner’s front dug in, and the back broke away. 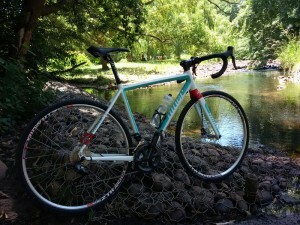 It was time for an attitude check – this was a bike that had to be ridden, not just thrown at the trail ahead. A couple of corners later I was starting to get a better feel, and just up ahead was the first very tame obstacle – a short ramp up to one of the farm dams on the trail. It was a nice test of both my handling, and the Ultegra Di2 gears. I left it until the last moment before giving the shifter a tap. With the slightest whir, the rear derailleur dropped down a gear and I powered up the rutted track to the top of the bank. A stupid grin spread over my face – that was more like it! Being such a beautiful day to be out playing with a new machine, I hopped off to snap a quick memory photo (the picture at the top of this article). 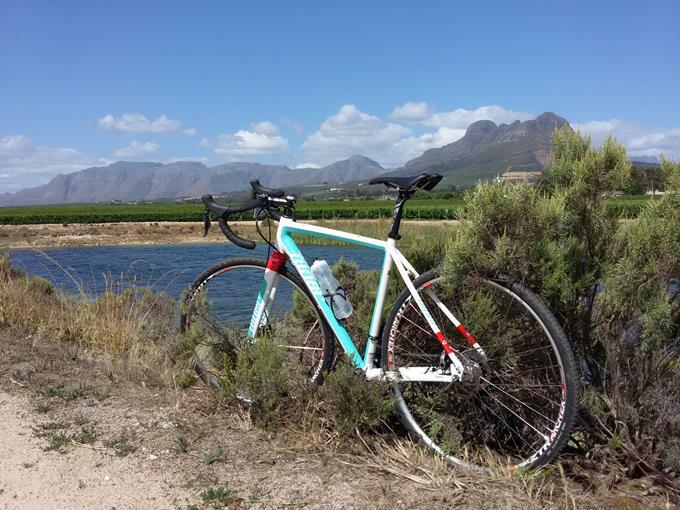 The next couple of kilometers were wonderfully uneventful – just glorious riding through the vineyards on a summer’s day. As I wound passed Somerset College, I knew the next test was coming up just ahead – a lengthy section of single track. Normally, it’s a fun, non-technical section, but on this machine who knows how I’d get on. The first section, around another dam, was a lot easier than I expected, but the sharp downhill at the end definitely exposed my lack of skill. Normally I’d get my weight backwards and just rip down, but I couldn’t figure how to do that and still be in control of the brakes. With a complete lack of any kind of flow, I skidded and slithered down gingerly. More practice and experience was needed there for sure. The drama soon passed, and as the trail flattened out and wound through the woods my speed picked up and I began to flow left and right through the curves. Even the little humps, bridges and drops weren’t any problem. The Niner rode like a big, rather stiff, and somewhat hard mountain bike. I was more than a little disappointed when the single track came to an end and I rejoined the dusty farm tracks again. Single track? PASSED. I hadn’t really expected to see many other riders, but I wasn’t quite prepared for how utterly deserted the trails were. 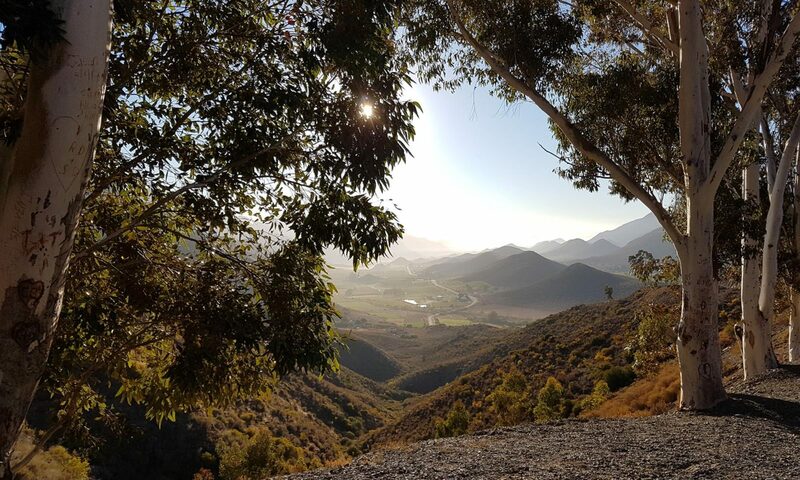 I saw a couple of families sitting out on the stoep of neighbouring farm cottages, one yard with some children playing, and two dogs who came running out of the vineyards to greet me – they’d probably been chasing mice, or moles. But aside from those brief encounters, I was utterly alone. It became a little eerie at times – our club trails are generally fairly safe, but there has been the occasional incident, especially around the Faure waterworks which I was just reaching. I put such thoughts out of my head and resisted the temptation to turn right and take the direct route to the top of the hill where the Vodacom tower sits. I wanted to see how the Niner climbed, and that meant swinging left down an extremely rutted and bumpy track to reach the bottom of a much longer climb to the same point. The Niner bucked and kicked and more than once threatened to throw me off, especially when I failed to pilot it carefully enough – you really need suspension if you want to just roll over boulders rather than go around them. Somehow I stayed on though until I came to the start of the hill back up. I wasn’t just interested in how the bike climbed, I wanted to see how well the gears shifted under load on a corrugated trail with patches of loose dirt. So I started off steadily, 34 tooth gear up front and about half way down the cassette on the back. I hung on to each gear as long as possible so that when I did drop down, it was under heavy load and at low cadence – pretty much the worst conditions to be trying to change gear. But there was no reluctance, no crunching, grinding drag of the chain across the cogs. The electric mechanism just kicked it neatly up the cassette and we pushed on, one gear lighter with some extra spin in the legs. I was quite surprised though how hard I was pushing when I hit the top of the cassette – 32 tooth, the biggest ring. By road standards, I’d normally be spinning like a hamster, but here I was still pushing with some force up the hill. A nice clear example of why mountain bikes benefit from such a wide range of gearing. Of course the upside of pushing a heavier gear is that the tower and hill top soon came into view. I didn’t break any records, but I was only a few seconds outside my personal best. Not bad for a first ride on a new bike, when I’d most been experimenting with the gears rather than aiming at a fast time. Climbing test? PASSED. At the top of the hill I ate some energy bar and took a few swigs of water. I’d originally intended to head home from this point, but it was such a stunning day it seemed a shame not to ride a bit further. So I headed down the hill towards Somerbosch – there was another short snaking single track section called Ella’s Arrival just before the farm which I was interested to try, plus the sharp right hand turn down and across the delightful little bridge known as Clayton’s Crossing. Both of these proved as much fun as expected, although I did nearly come to grief on the single track a couple of times when I dug the front wheel in a little hard through the curves. The only truly tricky spot was a short section of trail between these too where the sand lay deep in ruts cut up by farming equipment. This was the only stretch where I really battled to keep any kind of momentum going, and one or both feet dropped to the ground more than once as I lost my balance. To be fair though, the tyres are loaners whilst we wait for stock of the Ritchey WCS tyres to come in. It’ll be interesting to come back and redo this part on better rubber. The names of course come from his love of Star Wars Rebels, but they also happen to suit the colour schemes pretty much perfectly too. So there you have it – the real answer to the mysterious blog titles. When I first wrote this entry I was so focused on trying to capture the spirit of the ride, I completely forgot to talk about the spec. Doh! Time to put that right. The frameset itself is a 2014 Niner RLT alloy with carbon fork, as reviewed here. Bars and seatpost are both Shimano PRO PLT, as was the stem although following that setup session I’ve now swapped it for a shorter KCMC 100mm stem flipped up. No particular reason for choosing that stem other than I had it lying around in my box of bits and it happened to be the right size! I may look for more forgiving seatpost options too if, as planned, I do use the bike for longer journeys. I’m not sure a Ti post really belongs on an alloy bike, but I may give it a try. Wheels are Stans ArchEx 29er laced to Industry Nine hubs – and quite honestly, they roll beautifully. The Ritchey WCS Shield 700×35 tubeless cyclocross tyres are now in stock and being fitted literally as I write this. As an experiment, we tried fitting a regular Continental 700x28c GP 4 Season tyre to the same rim in the bike shop one afternoon. It was a tight fit to get on, but filled out with rather a pleasing looking profile. I’m not sure that’s the way I’d go if I wanted a more road oriented setup, mainly because of how tough it might be to fix a puncture roadside. But it’s nice to have as a possible option if there’s no budget for a second wheelset. Braking is taken care of with TRP Spyre mechanical callipers with 140mm rotors. 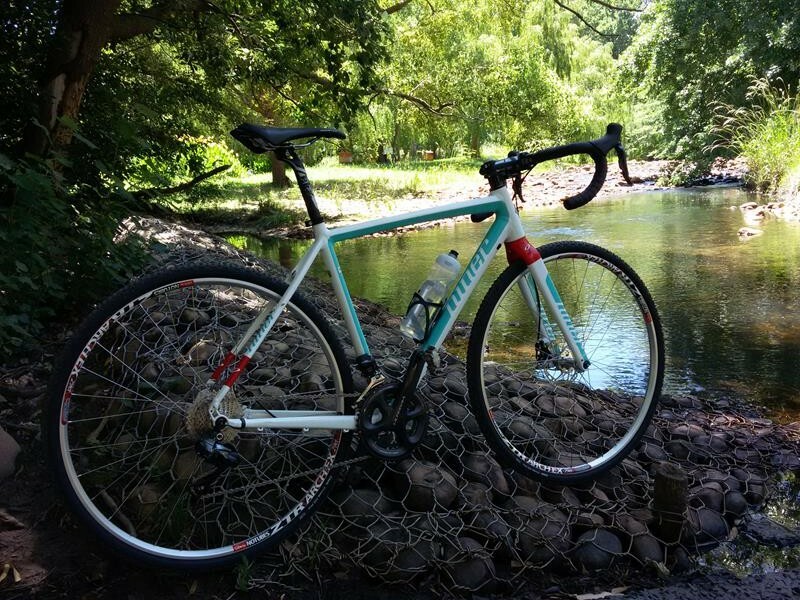 Hydraulic would have given more stopping power, but based on my friend Peter Müller’s positive experience with the same brakes on his Specialized Diverge I figured they’d be fine. Plus, on a long ride in the middle of nowhere it’s a lot easier to replace or adjust a cable than bleed a hydraulic line. On the first couple of rides I was a little worried if I’d chosen badly – but all of a sudden, coming home on this test ride they began to bite nicely. Chatting with both Peter and William, it does seem there is a minor running in period before they reach full braking power. Finally groupset – and here it must be said, that going Ultegra Di2 was possibly a tad extravagant. The official excuse is of course that I may do a ride such as Trans Continental on this machine one day, and electric shifters are a lot more manageable on hands developing long distance cycling induced palsy. Subconsciously though, having not gone for electric shifting on my new road bike there was maybe an element of lingering gadget envy in the choice. Either way, I love it and am glad I chose it. For gearing I stuck with my regular 50/34 compact chainring, but went for a long cage rear dérailleur so that I could fit an 11-32 cassette. Even that may not be enough to tackle days of climbing in The Alps on a heavily loaded bike, but it’ll certainly be a big help. So there we go, kit spec now included – better late than never!